Forgot to mention that the Snow Goose Festival was also very well attended by the snow geese. We were expecting some bad roads on the way to town for the Wild Goose Chase run, and it was a good thing we left early, because they were bad. Lots of blowing snow, drifts coming on to the highway, only one other vehicle in 90 miles of travel. Ninety miles on pavement, on a U.S. highway, and only one other vehicle. It was coming from the other direction, so at least I knew the roads were passable. Although it was 4WD. And after 20 miles I couldn't see it's tracks on the road anymore. This is what I saw. The road conditions had deteriorated. No plows had been out yet, so we got to break trail with our 4 inches of clearance. Fun times. It got worse than this, but I didn't try taking a photo. And then Desert Boy had to pee. Trips are always an adventure with little kids! Fortunately we made it in plenty of time to register and were astounded to see so many other crazy fools braving the snow storm for the opportunity to go run and get sore muscles. 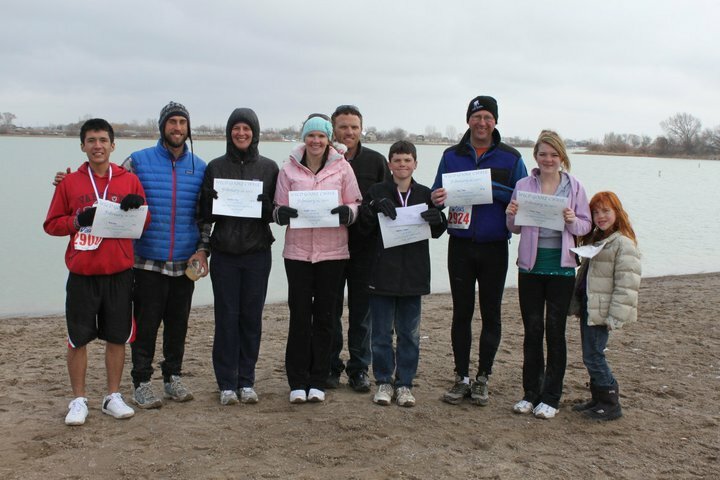 They had a 5k and a 10k, and our group of seven from the valley participated in both. 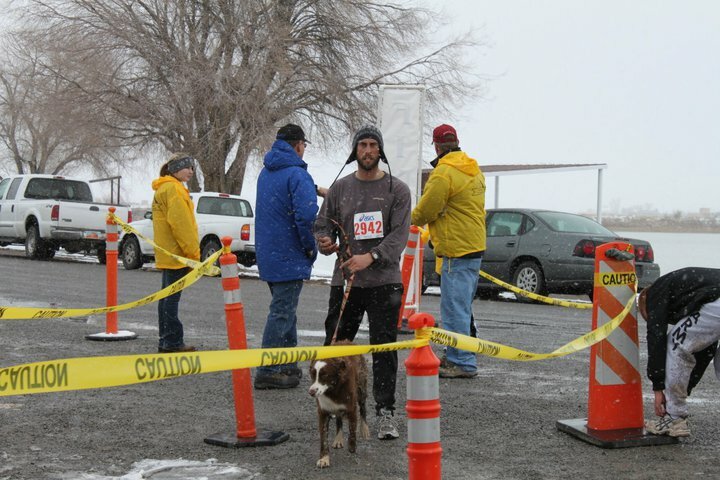 Here's Desert Boy at the finish. 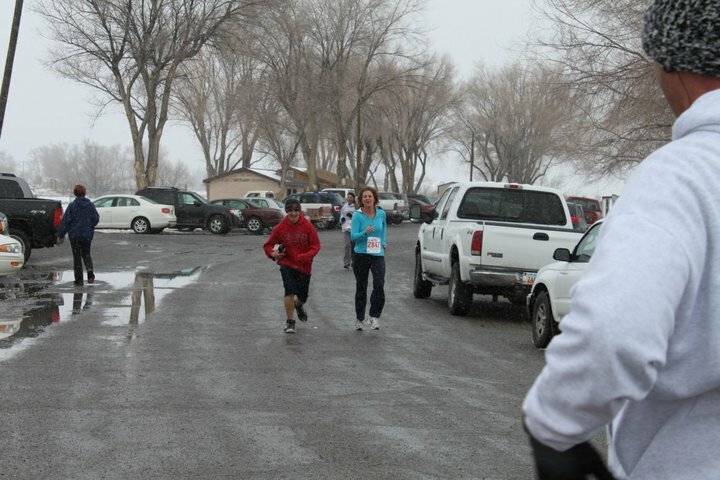 He said he wanted to run in the race, so I had him run while I warmed up in the parking lot. Then we were off. I didn't get any starting photos or photos of the route, but fortunately Ben and Breanna got photos of the finishers. Here's Jeremy, who came in second in the 5k. Actually, his dog came in second, so he came in third. 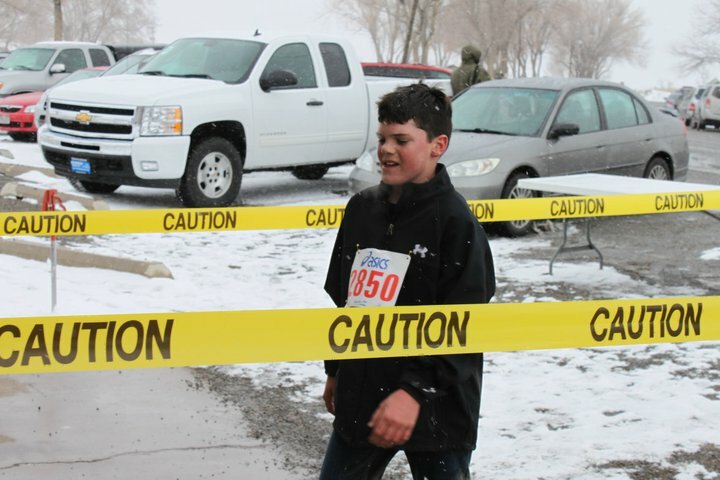 Christian was the first finisher for the 12 and under group. He ran in jeans, because that's what he always runs in. I'd really like to beat him, but I'm afraid he's going to get faster than I can get faster. Here I come next to a poor guy who had pulled a muscle. 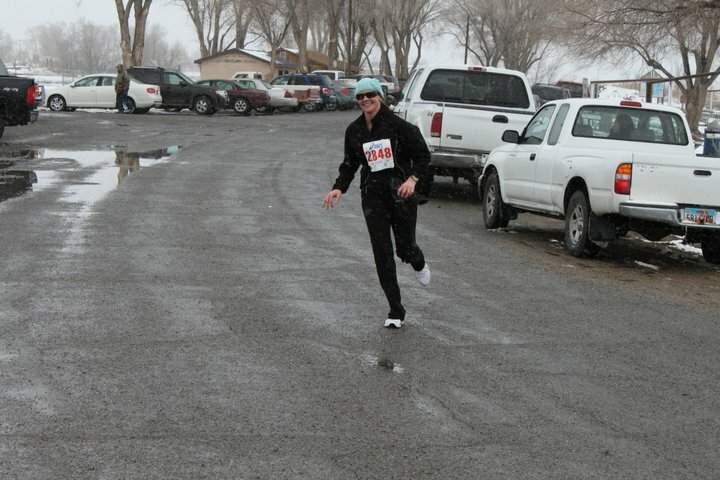 Chandra managed a big smile on her turn into the finish. 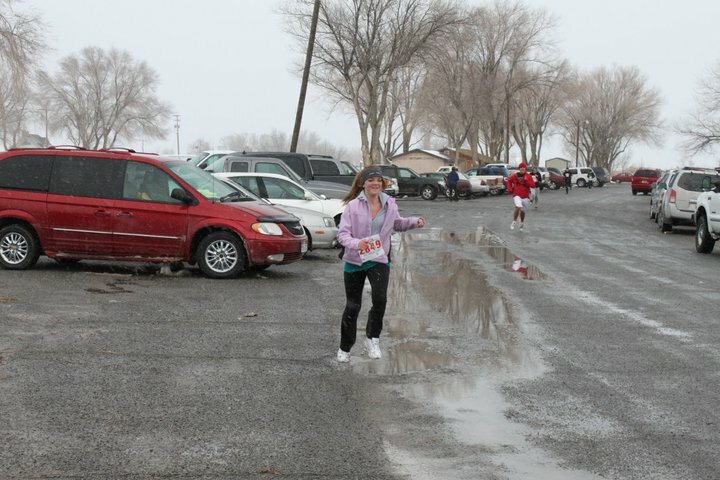 Here's Breanna skirting the puddles. There was still a cold north wind and snow falling most of the time, but it was warm enough to melt some of the ice on the ground. The biggest obstacle was the mud--part of the run was so muddy that I had to repeatedly kick the mud wads off my shoes. 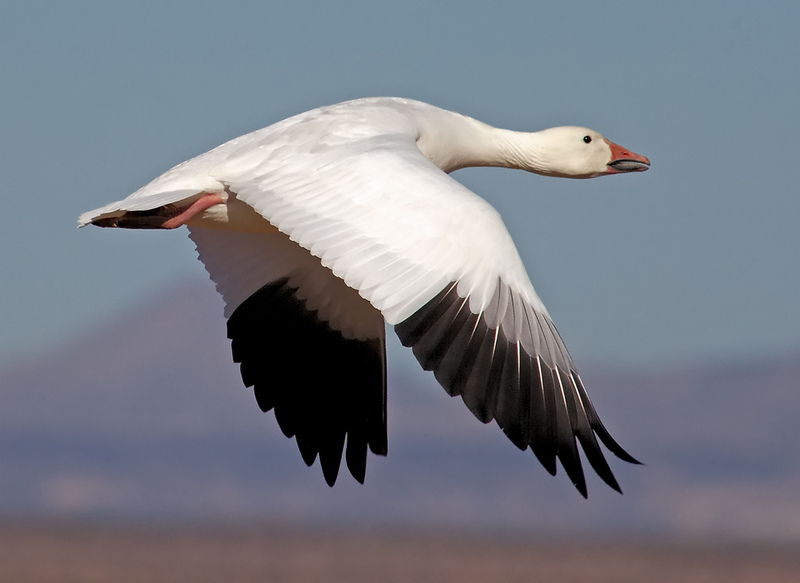 The snow geese made a grand entrance flying overhead. The kids had fun pushing Desert Girl's stroller around. Then came the 10k finishers, with Greg checking his time at the finish. Hector kept taking off layers as he ran. He won his age group for the 10k. While the race organizers were busy compiling results, on the other side of the road people were gathering for Dunk, Dunk...Goose, a.k.a the Snow Goose Plunge. For only $10, a person could heave his/her body into the frigid reservoir and get a t-shirt. The t-shirt said "I got goose bumps at dunk, dunk...Goose." Desert Boy tested the waters. He really wanted to swim, but I convinced him to wait until later, when we could go to the heated indoor pool. But there were plenty ready to take the plunge right then. They all charged in. Most then hurried out of the water. But a few stayed and played for awhile. It made me so cold just watching them! We went back to the Pavilion for the raffle prizes and also to hear the results. Our group gathered for a photo. It was really fun knowing other runners in the race. I'm not sure of the official count, but there were probably more than last year's 150 runners/walkers. Christian showing off his certificate. Emma was a good sport, not minding the cold. Photo shoot for the newspaper. I love the dog sitting behind them. And photo shoot of our group again. 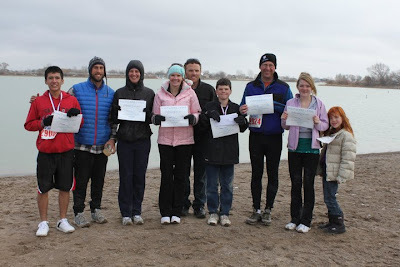 We were delighted that everyone placed in their age group. Next year we'll have to do it again, and maybe we can even recruit a few more people. One of the perks was a nice shirt. 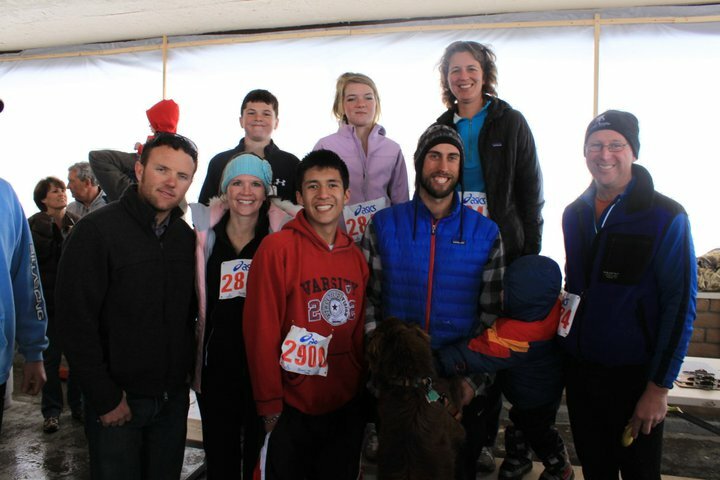 So thanks to everyone who helped sponsor the race! It was worth the long drive, crazy weather, and mud. And we did eventually find the Navajo tacos after the race, but we had to huddle in the van to eat because it had started snowing again and was too cold to stay outside. Maybe next year we'll get some warmer weather! Wild Goose Runs in Blizzards? Anyway, we're getting ready to head to town tomorrow for the Snow Goose Festival. They have a variety of events, including a 5k/10k run, which attracted my attention. We're having a cadre of runners from around here go, and I've been training for a couple months and can't wait to see if I can make my goal. The only problem is that we're under a winter storm warning, and the brunt of the storm is supposed to hit tonight and tomorrow. I called the race director to see if the event was still on, and he said it would be held no matter what. They had snow plows to clear the course and heaters in the pavilion. Plus, he told me in a very excited voice, at 11 a.m. there's the Snow Goose Plunge into the reservoir. Eighteen people are signed up to do it--they get a t-shirt in return. Hmmm...wonder if any of our group might be taking the plunge, too? So we'll get ready to drive in snow, run in snow, and watch people plunging their bodies through the snow into some really cold water. Who says winter is boring? I promise, I'll post the outcome of all this in a somewhat timely manner (within a few days, anyway). That's if I don't end up frozen solid first. There comes a time in a woman's life when she just needs lots and lots of desserts. Hence the Delectable Decadent Dessert Party. Yum. Everyone brings a dessert. Everyone eats desserts. Everyone takes home a sampling of desserts. Life doesn't get much better. Thank you. And in case you're wondering--chocolate pudding pie, raspberry cream crepes, pecan pie, yummy custard, caramel corn, Oreo truffles, sweetie pie cookies, crockpot chocolate cake, oatmeal raisin cookies, rice krispie treats, and cherry pie. The winter storm warning we were under for the weekend didn't amount to any snow falling in the valley, although we welcomed a little rain. Apparently Desert Girl was ready for a little white floating through the air. When I heard heard her wake up from her nap, I walked in and found her in the midst of emptying the Kleenex box. She had already made a lot of progress. So I did what any extremely sane mom would do--I ran out of the room to get my husband and camera. Being discovered didn't slow her down. Not one bit. But she did have the decency to check if she was in trouble. Then, taking a lesson from her big brother, she smiled big to show off how cute she was. I was already won over. Back to work! There are a lot of Kleenex tissues in one box, and Emma wasn't going to stop until she had finished the job of emptying the entire box. And she's still not done. Now she's decided that one at a time isn't fast enough; she's trying to get handfuls of them. What kid hasn't done this? Or at least dreamed of it? It even looked fun to me. We saw some big machinery near the post office and went to investigate what was happening. They're busy tearing out the old parking lot and putting a new one in. This is one of those Stimulus projects. So was last year's, when they tore out part of the parking lot and replaced it to improve handicapped access. And if you're wondering if the parking area that got put in last year was torn out this year---the answer is Yes. I'd much rather have my tax dollars going towards putting in sidewalks in town so we don't have to walk down the highway with our kids or redoing the tennis/basketball court by the school. But I don't get to decide these things. The parking lot didn't look so big when it was all paved, but once it was torn up, it looked quite a bit larger. They started pouring the new concrete curbs. The weather isn't exactly being the most cooperative, but it is winter after all! We'll see how this project turns out. And then maybe we'll figure out how to rig a tennis net in the middle of it. Well, this photo pretty much sums up our week! Sick family, plenty of mud, and getting really aggravated about not having our Internet working. It's made us all tired! Pushing Desert Boy home while holding Emma/balancing her on top was an interesting experience. Hopefully we'll recoup this weekend. Hope you have a good weekend, too.